Yes, even I braved the traffic, crowds, and fast talking salesmen (thankfully, there wern't that many fast talking salesmen) to go to a few stores this weekend. I needed something from the hardware store and more food. Rest assured that I chose stores that were as far from the madding crowd as I could get. And I shopped for food when the Colts football game was on TV, further guaranteeing that there wouldn’t be many other people shopping at the same time. At the hardware store, I took the long way around so I could pass by the houseplants and saw these “just add ice orchids™". This is the second store I’ve seen them in, so it looks like they are making the rounds. The instructions say to just add three ice cubes every week to water the plant. They could not have made it sound easier, could they? So simple! Just take the cubes of the frozen form of water and let them slowly melt on top of the bark they grow these orchids in and you’ve completed your watering duties for the week. And on their website, you can even register your email address and they will send you a weekly reminder to go get those three ice cubes and “water” your orchid. But in my opinion, it is so wrong! The proper way to water an orchid, or any indoor plant for that matter, is to first determine that it actually needs to be watered, timing of which will vary depending on the conditions where it is growing, including the humidity level, then thoroughly water it, letting water drain out the bottom. I don’t think that’s very hard to do, is it? Why this ice cube gimmick? Have we become that lazy? I wonder if the growers used ice cubes to water these orchids? I’m guessing they didn’t! I’ve posted before about not watering with ice cubes. At work one year, they nearly killed several poinsettias by watering them with ice cubes. The cubes melted, but the water only penetrated about an inch down in the soil - the rest of the root ball was as dry as dust! I would guess the same would happen with these orchids. Three cubes a week would not thoroughly wet the growing medium. Someone give it a try and convince me otherwise. Until then, I’d say if you want one of these orchids, get one because they are pretty. Just please water it with room temperature water when the bark begins to feel dry and water it thoroughly. Speaking of poinsettias, at the big box grocery store, I had my first sighting of painted poinsettias this year. These were first introduced a few years ago, as I recall. I don’t like them and I have never found anyone who does like them or who will admit to liking them. But somebody must be buying them because the growers would not go to the added expense and effort to paint them just to paint them. So who is buying them and why? What ever happened to just plain red poinsettias? These painted poinsettias and the “just add ice orchids™" have to be the fault of marketing groups. Who else could be responsible? The consumer for buying them? I just can’t imagine a gardener, a plant lover, falling for either one. Can you? That's just so depressing, isn't it? The ice cube thing sounds plain silly, but the painted poinsettias? Ugh! I've never seen painted poinsettias and I don't really want to. As for the ice-cubes, it's obviuously just a gimic to encourage a purchase. Crazy! No painted poinsettas have graced my home. They are odd looking to me. Ewww- those painted poinsettias are hideous! Not in my house - no way, no how! Oh, I don't like the painted poinsettias and this photo reminds me of why they make me cringe. Perhaps, the right color plant in the absolutely perfect room could work. Trying to be positive here. I once had some annuals planted on a slope and used ice cubes to water them. Seems kinda silly now that I think of it. I'l sometimes throw ice from a left over glass of iced tea on my sanseveria at work. But that's pure laziness, because I don't feel like walking all the way down to the end of the hall to dump it in a sink. Plus, it pains me to throw out water in any form. But growing a plant specifically to throw ice on it? I call balderdash on that one. Yuck to both of those. I think Jackie is right about the ice or cold water. We're talking tropical plants here. I don't thing they'd appreciate a cold shock. And as for Poinsettias, well, I never buy them anyway. I didn't know they painted poinsettias....that is just wrong! I would have figured orchids would not like to be watered with freezing cold water, strange. Sadly I bet they sell many of those orchids with those easy instructions. Although with orchids, especially Phaleonopsis, that might just work. The roots are near the surface and the slow melting would probably keep the bark at the right sponginess. I'll have to give this a try sometime. I saw thosejust add ice orchids too. I wondered how long they would last in my house? And I say boo to the blue poinsettia. Ugh. That is getting carried away. I am a traditional red or white girl. Yucks all around. If that's what Americans spend their money on, I'm not going to listen to any more whining about a recession. Get real, people, and enjoy life more. This is my first information on watering with ice cubes....This is one of the most 'stupid' gimmicks I have read about in a long time..surely it would not work! 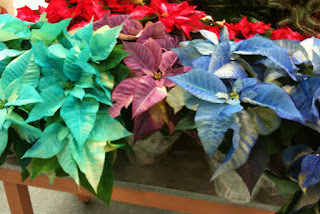 The painted poinsettias make my stomach hurt..who in their 'right' mind would do this to a naturally beautiful plant? and the glitter/sparkle ones....oh, I just get ill thinking of them. No, I can't imagine a gardener falling for either. But non-gardeners still outnumber us, sad to say. And they have money in their pockets. Well, both of those things are just plain wrong ... and I am unanimous in that! I agree with everything you say. And one of the reasons I don't have indoor plants is because I do kill them and I want the break from taking care of plants ( if done correctly it is a responsibility greater than adding ice cubes). I spend so much time and effort in the gardens outside and our season is forever long---I don't need indoor plants. I'm certainly not going to buy a blue poinsettias. Plants don't like to be shocked with cold water, just like people don't. Who could possibly think that it's good idea to water any plants with ice?! And those poinsettias are heinous. NOOOOOOOOO!!!! (Runs screaming from the room at the sight of those painted poinsettia monstrosities) I haven't seen them around here this year, yet. And the orchid with icecubes is just so wrong. Must go stare at happy orchid blossoms in my office to regain sense of zen. Whenever I see a painted/glittered poinsettia I want to hide somewhere to see who is buying these things. Have you ever met anyone who admits to liking glitter on their poinsettias? As for the ice cubes, it's clearly a ploy to appeal to the lowest common denominator--people who have no success at growing plants and who don't give a hoot anyway. They probably eat at McDonald's too. They're a funny plant group! Also, I've added your blog to my list of favorites on my own. Well, I guess the one advantage all this nonsense has over plastic flowers is that they'll compost, not pollute. Let's face it, we've become a lazy society, or at the very least a society that wants instant gratification, hence the ice-cube orchids. Hello! One of the fastest ways to kill an orchid is to over-water it. Although the size of the ice cube doesn’t matter, they should measure about 1/4 cup of water when melted. If you are unsure when to water your orchid, the roots are a great indicator for watering. Well-watered roots should be a healthy green color, while grayish-white roots indicate more water is needed. 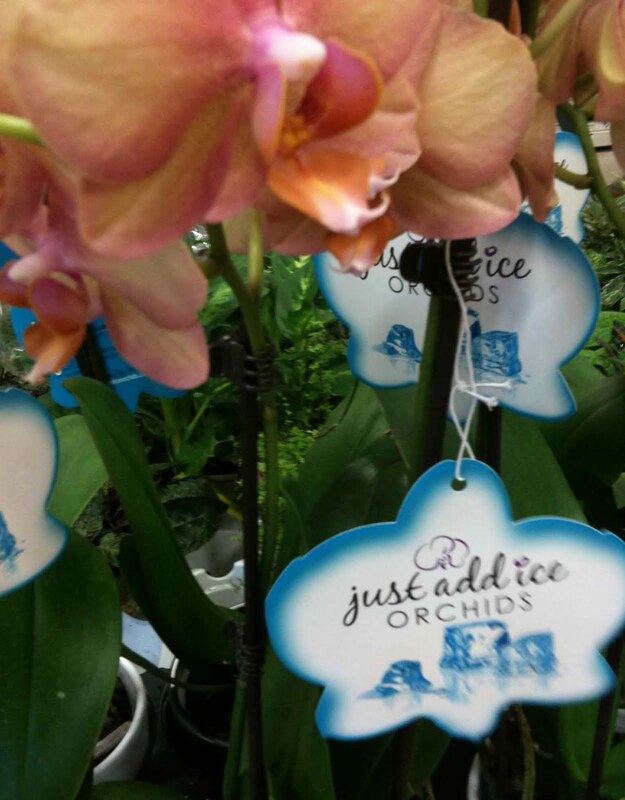 Watering orchids with ice will not harm the leaves or roots. When placed on top of the media, the ice cubes will slowly release over time with no worries of over-watering. With the slow drip process, the water melts into the bark soil and seeps into the roots. The roots slowly soak up the water as it drips down, which prevents water from sitting at the bottom of your pot.